Callers who cannot communicate verbally are now able to use the text to 911 service to request help directly from local public safety agencies. This technology directly benefits members of our deaf, hard of hearing and speech-impaired communities as they will now have a more efficient and effective way to request emergency services in times of need. Additionally, those who find themselves in a situation where it may too dangerous to dial 911 will have another option to call for help during an emergency. For the deaf, hard of hearing and speech-impaired c ommunities, texting to 911 is always an acceptable way to contact 911 for help. Others should only use the text to 911 feature when speaking to a 911 Dispatcher is not possible or may place and individual at risk. Examples include a domestic abuse situation, an active shooter incident, or an incident that has caused injury resulting in an inability to speak. Otherwise, it is always best to dial 911 and speak with dispatcher directly. 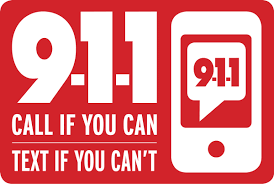 Only call 911 in the event of an emergency and only text to 911 when calling is absolutely not an option.